Cape Henry Lighthouse is the first federally funded public works project of the newly formed United States government. It was authorized by George Washington and overseen by Alexander Hamilton. The Lighthouse is situated near the “First Landing” site where English settlers first set foot on their way to settle in Jamestown. Built with the same Aquia sandstone as much of Washington, D.C, the lighthouse guided sea travelers to safety for almost 100 years. 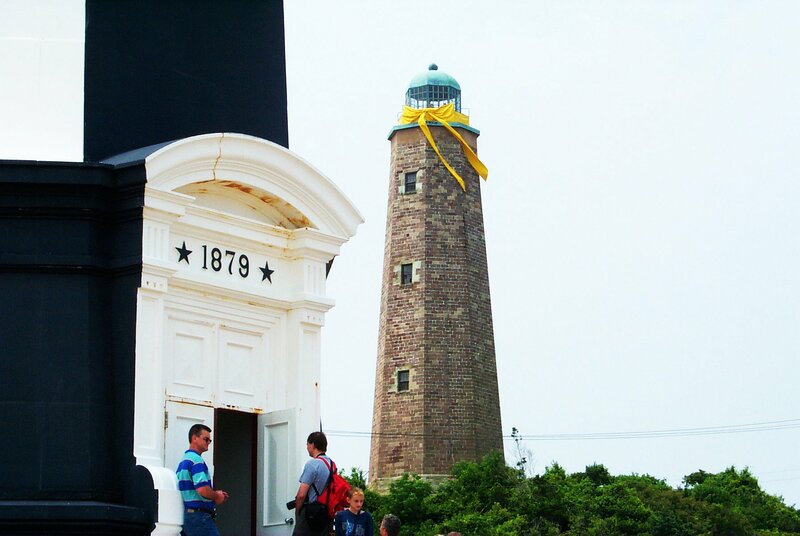 The distinctive black and white striped “New” Cape Henry Lighthouse was built in 1881 but remains closed to the public. Preservation Virginia members placed a tablet on the tower in 1896 to mark the site of the “First Landing” and in 1930 an act of Congress deeded the Lighthouse and surrounding land to our care. Today, Cape Henry Lighthouse is surrounded by the Joint Expeditionary Base Fort Story (JEBFS). Please review the guidelines provided by JEBFS for entering the military base before your visit. Cape Henry Lighthouse is open daily. The last shuttle to the lighthouse boards 45 minutes prior to closing. 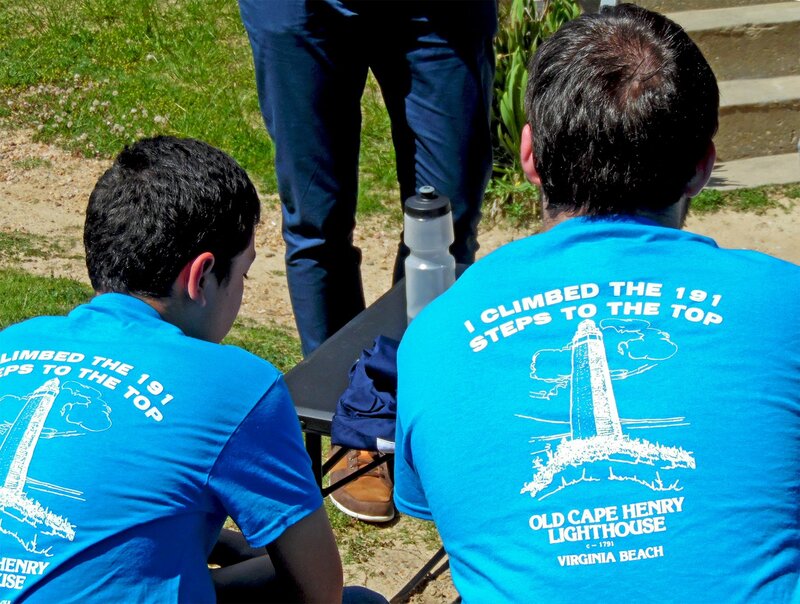 Jan 3 to March 15: 10 a.m. to 4 p.m.
March 16 to Oct 31: 10 a.m. to 5 p.m.
Nov 1 to Dec 30: 10 a.m. to 4 p.m.
Make the climb up Cape Henry Lighthouse. 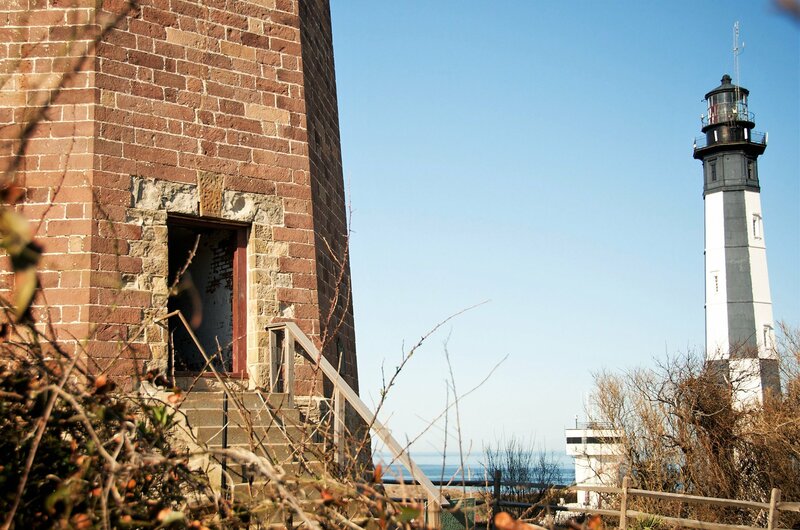 Climb the tower for a gorgeous view of the Chesapeake Bay. All climbers must be at least 42 inches tall. Please note: During the summer months, the temperature at the top of the tower can reach extreme levels. Cape Henry Lighthouse will close the tower when the heat index inside reaches 125°. We also close the tower during thunderstorms and when lightning has been spotted. Visitors will still be able to walk to the top of the dune and shop in the museum store. Winter weather advisories also may effect the opening of the tower. Explore more than 400 years of the historic Cape Henry area every hour. Trained interpreters discuss the rich history of the Cape Henry area as a port during the beginning of the United States. Engage with fellow guests as you discuss STEM-related topics, including weather, geology and marine life. Visit the nearby National Park Service site where the first English colonists landed in April 1607. Pack a lunch and eat at one of our picnic tables. Before visiting Cape Henry Lighthouse, please be sure to read the additional information at the bottom of this page. This information includes guidance on location, arrival, and rules and regulations. Tours stop 30 minutes prior to closing. January 3 to March 15: 10 a.m. to 4 p.m.
March 16 to October 31: 10 a.m. to 5 p.m.
November 1 to December 30: 10 a.m. to 5 p.m.
Closed Thanksgiving, Christmas Eve and Day and New Years Eve, New Years Day and January 2. 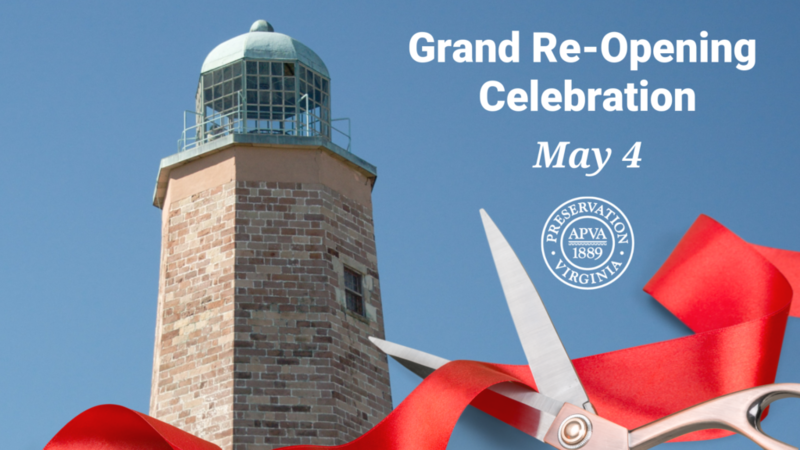 The tower at Cape Henry Lighthouse is re-opened for climbing and you’re invited to celebrate with us on May 4 during a ceremonial ribbon cutting. Learn more and mark your calendar! Call ahead and reserve a special discounted rate for groups of ten or more. Cape Henry Lighthouse is a beautiful 18th century lighthouse located in scenic Virginia Beach, Virginia and just steps away from the coast. Make your event truly special with Cape Henry Lighthouse’s unique blend of colonial Virginia architecture, history and enchanting beach views. Special Events: Rent our grounds for your special occasion. Pricing starts at $100 per hour. Cape Henry Lighthouse is located on Joint Expeditionary Base Little Creek-Fort Story at 583 Atlantic Ave, Fort Story, VA 23459. A new shuttle service was implemented on Oct. 15, 2018 to improve base security requirements which also provides an easier, safer and more convenient visitor experience. The shuttle service is expected to significantly reduce the amount of time visitors spend at the main security gate Gate 8 entrance which is located at 89th Street and Atlantic Avenue. NOTE: Visitors with an authorized government ID will be allowed to drive directly to Cape Henry Lighthouse. NOTE: All other items will need to remain in vehicles. Upon arrival at the gate, guests need to inform base security personnel that they are visiting Cape Henry Lighthouse and produce the required documentation as noted in “Base Access Requirements” above. Security personnel will direct guests to parking adjacent to the gate. Visitors will proceed to the awning area for a security check before boarding the shuttle to be transported to the historic sites. Upon completion of visiting the historic sites, guests will need to board a shuttle to return to their vehicle at the designated parking area. NOTE: To assist base security personnel in processing a group to visit the historic sites, group organizers should produce a list of all riders to security personnel. The list should provide complete names (first and last) of all visitors to include the bus driver. Upon completion of the visit, the bus will need to depart via Gate 8 upon which it entered. AMERICAN EVOLUTION™ commemorates the 400th anniversary of several key historical events that occurred in Virginia in 1619 that continue to influence America today, including the first representative legislative assembly in the New World, the arrival of the first recorded enslaved Africans to English North America and the recruitment of English women in significant numbers.